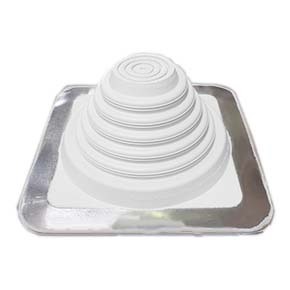 Sealing tightly with sealant and almost any type of fastener, the flexible base is virtually compatible with any roofing material -- metal, plastic, asphalt, tile, rubber membrane, and more. Uniform Plumbing Code / UPC Listed Master Flash was used to create a new engineering standard for profiled roofing by the International Association of Plumbing and Mechanical Officials (for the Uniform Plumbing Code). Environment Control: Provides a permanent seal that controls gaseous or liquid environments to eliminate leakage and odor contamination. Corrosion-Resistant Base: Base is made of heavy-duty aluminum alloy for flexibility and corrosion resistance. Roof Pitch-Adaptability: The stepped-cone design makes Master Flash easily adaptable to most roof pitches. WARRANTY: Manufacture provides 20 year limited warranty. Other sizes and colors available to fit 1/4 to 26" nominal pipe sizes.